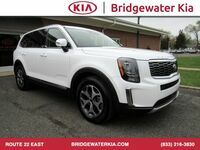 If you are looking for a large SUV that will do anything you ask of it, look no further than the all-new 2020 Kia Telluride. This SUV originally started as a concept vehicle that appeared in the 2016 auto show circuit, and it received rave reviews from both experts and regular drivers. After the auto show season, Kia took the Telluride back to the drawing board to make it perfectly in tune with today’s demands. Now, the Kia Telluride is ready to hit the road! Named after the popular mountain town in Colorado, the 2020 Kia Telluride is ready to handle a variety of road conditions ranging from rain-soaked highways during hurricane season in New Jersey to hairpin turns on mountain roads. Thanks to specially-designed technologies like Torque Vectoring Cornering Control (TVCC) and available all-wheel drive, you can enjoy the ultimate road trip or head home for the holidays with confidence! Under the hood of the 2020 Kia Telluride is a 3.8L Lambda DOHC V6 engine, which cranks out a 291-horsepower / 262 lb.-ft. torque power output. This amount of power allows the 2020 Kia Telluride to pull up to 5,000 pounds. Taking its cues from America’s natural landscape, the 2020 Kia Telluride comes available in a spectrum of colors that include Dark Moss, Everlasting Silver, Ebony Black, Snow White Pearl, Gravity Grey, and Black Copper. The 2020 Kia Telluride can accommodate up to seven or eight passengers and offers a generous 21 / 46 / 87-cubic foot cargo space. With the 2020 Kia Telluride, you can bring everyone and everything on your next adventure! 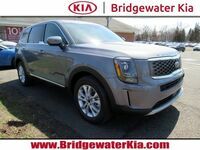 The 2020 Kia Telluride will soon be available here at Bridgewater Kia, so reach out to us to learn more!